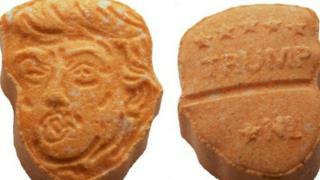 About 5,000 carrot-coloured ecstasy tablets in the shape of Donald Trump's head have been seized by German police in the north-western city of Osnabruck. The drugs were confiscated over the weekend, police say, and an Austrian father and son have been arrested. It's thought the drugs would have been sold on the internet under the slogan "Trump makes partying great again". Ecstasy pills can sometimes kill drug takers but more commonly induce nausea, panic, paranoia and agitation. Police in Germany say the pills and a large amount of cash were found during a search of the vehicle driven by the two suspects and that the drugs have a sales value of nearly $47,000 (€40,000; £37,000). One side of the tablets shows Mr Trump's face and exuberant hairstyle while the president's surname is written on the reverse. The 51-year-old father and his 17-year-old son travelled to the region from the Netherlands, local media has reported, where it is thought the drugs originated. The pair are now under arrest and in custody.